At the Hamilton, Montana Performing Arts Center, Vincent speaks with three local high school graduates and two high school teachers about how Rocky Mountain Laboratories influenced school science programs and opened up career opportunities. Vincent, Elio, and Michael discuss a huge 30,000 year old virus recovered from Siberia, and nested symbiosis facilitated by horizontal gene transfer from bacteria to insect. 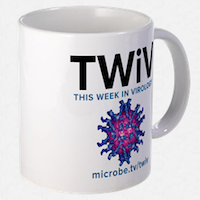 Vincent and Michael discuss how infection with influenza A virus disperses Streptococcus pneumoniae biofilms leading to disease, and an amazing protein chainmail in a viral capsid.